Below are the specifications for the Eclipse 500 very light jet. Most of the specifications listed below only apply to jets that have the proper upgrades or are upgraded to "Total Eclipse status". These upgrades are listed in the Eclipse / Federal Aviation Administration (FAA) approved service bulletins. Definitions for some of the abbreviations: ISA: International Standard Atmosphere, ft: Feet, m: meters & lb: pounds. 6 seats max, including pilot. 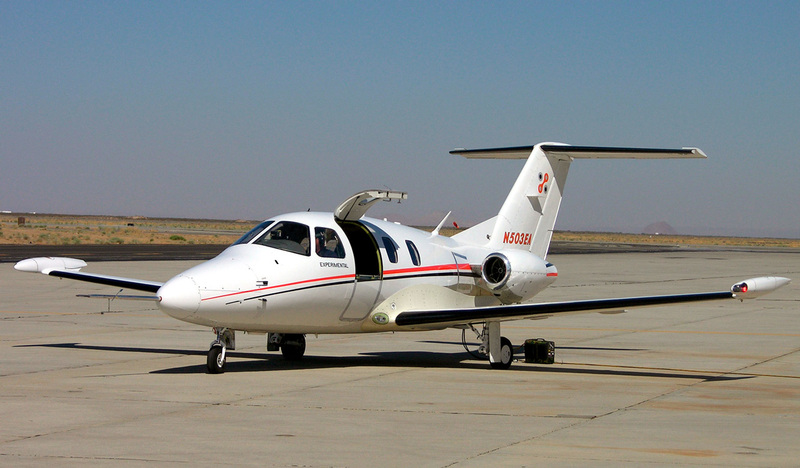 Eclipse 500 aircraft have an aircraft life limit of 10,000 hours, 10,000 cycles, or 10 years. Aircraft life may be extended to 20,000 hours or 20,000 cycles if the aircraft is maintained in accordance with Eclipse FAA approved Service Bulletin SB 500-04-006. Cabin altitude is at sea level up to 21,500 feet or 6,533 meters. Cabin altitude is at 8,000 feet when flying at 41,000 feet. Eclipse 500 Takeoff Distance: 2,345 Feet, 715 Meters (to 50 ft sea level, ISA to 50 ft (15 M) at maximum gross takeoff weight (MGTOW)). Eclipse 500 Takeoff distance: 3,881 feet or 1,183 Meters at 5,000 feet with ISA +15˚C. Eclipse 500 Single engine takeoff climb 705 feet per minute or 125 meters per Minute at 5,000 feet at ISA + 15˚C. Above Eclipse 500 specifications page photo by Alan Radecki on Wikimedia Commons. Photo released under a Creative Commons License. Aircraft serial numbers 000266 through 000267, serial numbers 550-0268 and up are approved for flight into known or forecast icing. Serial numbers 000001 through 000262, and 550-0263 through 550-0265 which incorporate Eclipse FAA approved Service Bulletin SB 500-99-005, are approved for flight into known or forecast icing. More on the details and specifications on engine can be found on the Eclipse 500 Engine PW610F-A page. 1,125 Nautical Miles or 2,084 Kilometers (Max NBAA IFR 100 nautical mile alternate, 4 occupants, 200 pound pilot and three 170 pound passengers.). Data on The Eclipse 500 Jet specifications is from a variety of sources like the aircraft manufacturer's publications & data from aviation regulators like the Federal Aviation Administration (FAA). Also note that these Eclipse 500 specifications are also called the Eclipse EA500 specifications or the Eclipse EA50 specifications. This is due to the other names for the aircraft.